We provide old photo restoration and repair, digital photo enhancement and image editing services with NO OBLIGATION. Easy to use service, simple pricing, quality work at a competitive cost, 100% satisfaction guarantee. Try before you buy! Welcome to Caledonian Digital, where what you see doesn't have to be what you get! With our photo restoration and repair service you can halt the ravages of time. So don’t let your treasured photo memories crumble away. Get in touch NOW. Set higher standards for your photos, expect more! Don't settle for what you see. remove food or drink stains from clothing. get creative - remove colour from just parts of your photo. It's time for you to set higher standards for your photos, and to expect more. Don't just settle for what you see. What you see doesn't have to be what you get! Still not sure? Visit the Caledonian Digital video channel on YouTube where we'll be posting a few short videos like the one opposite to try to explain what we are all about and encourage everyone to try our photo enhancement and photo restoration services. 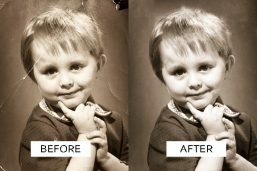 If you’ve held back from getting a treasured old photo repaired because you thought “no-one provides photo restoration services near me” then it’s time to think again. We’re physically located near Glasgow but with just a few clicks of your mouse the internet brings us near to everyone! If you can get your precious photo scanned then you can email it to us, or upload it through our website, quicker that you could jump in the car and drive to your local photo restoration provider. So come on "neighbour" stop using proximity as an excuse to delay on getting your treasured old photos restored - we'll take great care of your photos. Every photo deserves a second chance. So if you've been cleaning out the cupboards, or clearing out the garage or the loft, don't throw out any old negatives or slides you find, and don't give up on any old torn photos you come across. With our photo restoration & enhancement services and our digitisation capabilities, you can surprise someone with a restored or coloured photo that has long been forgotten – give the gift that keeps on giving! Visit our About Us page to watch our latest video. 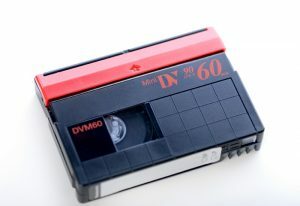 We can now also convert your digital mini-DV tapes, as well as VHS, VHS compact (VHS-c), and 8mm and Hi8 camcorder tapes. 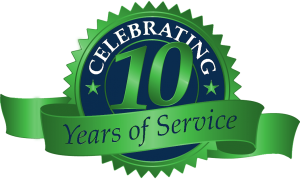 In 2016 we celebrated our 10th year of helping customers all over the UK and Ireland, mainland Europe, and America with their treasured photos, preserving the special moments in their lives for future generations to enjoy. 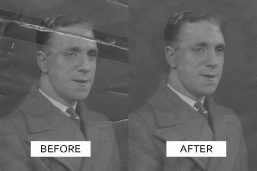 That means we’ve now been delighting customers with our services in photo restoration UK wide and beyond for 13 years, and we provide a no-obligation service so you always get to see the restored photo first. YOU could be our next DELIGHTED customer! Click each service to find out more. Let Caledonian Digital convert your treasured home videos to DVD so you can enjoy them for years to come. We can convert VHS, c-VHS, and Hi-8 video tapes. So dig out your wedding video, all the birthday parties, Christmas with all the family, or your favourite summer holiday videos. Cost is dependent on the final DVD run time, not on how many videos you have. If you have discovered envelopes stuffed with negatives or slides at the bottom of your memory box, or at the back of a drawer or cupboard when you’ve had cause for a clear out, please don’t throw them away. We can get you images from them as good as the day the original photo was taken. If they’ve been looked after you probably won’t even need our photo enhancement service. We can also get create a digital archive on DVD of your complete photo collection. Whatever you don’t like about your photos, with our photo enhancement services Caledonian Digital are here to help. Let us turn your photographic nightmares into the photos of your dreams. We can get you the photo you wanted to take. It’s time for you to set higher standards for your photos, and to expect more. Don’t just settle for what you see. What you see doesn’t have to be what you get! I write to thank you personally for the fantastic restoration job you did on my aged photo taken mid twenties last century in Monterey, California. The repair work is absolutely invisible, and the clarity and sharpness of image is perfect. Well done. Thank you for all your help. I am very happy with the quality of the work that you have done but I am more impressed with the time scale in which you have turned this round. I would definitely recommend you to anyone who would be looking for a similar service. ABSOLUTELY PERFECT, I couldn’t have wished for better, once again thanks. I’d just like to say thank you so very much not only for the quality of the photo but for your patience and speed of service, we’ll definitely be in touch again. Excellent job with no hassle. Additional enhancements done quickly and professionally. I think that the restoration you have done on the picture is exceptional, much better than I had anticipated. I am very pleased with your speedy service, prices, and quality and won’t hesitate to recommend you to others. Thanks for the work you’ve done on these 2 photos, I have just made my payment – all so easy! Thanks again. Wow! What amazing repairs! Seem so magic! Looks like very hard work!!! Wow wow! The colour one is very amazing….I couldn’t imagine what it was like in colour. It is very oldest picture in Kashmir. U did really great job! Once again many many thanks for the work you have done!!! Absolutely gorgeous! I now have a wonderful picture to remember my Granddaughter’s celebrations, thank you. Worth every penny. I will not hesitate to use you again and recommend you to all my friends and family. Thanks you for your speedy and professional service. I was upset that I was looking the wrong way on one of my wedding photos with my old school friends…but you sorted it beautifully. I would happily use you again. I really just want to say a huge thank you for this. It’s brilliant and I’m amazed at what a great job you’ve done. I can’t thank you enough. I have become a regular user of Caledonian Digital, because they always provide a great restoration service, and are always helpful and committed to providing great customer service. I would happily recommend them to anyone. 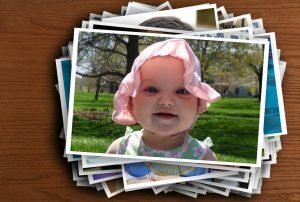 You might not actually need our photo enhancement service, you might already have perfect photos! 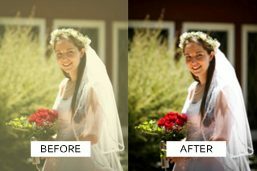 There doesn't have to be anything wrong with your photos before we can help! You might just want to try something a bit artistic with your favourite photos. Create a collage/montage, or add a splash of colour, or go for our full-on pop-art posters. We offer a range of photo products to make more of your photos, Gift vouchers, poster prints, VIP memberships offering 50% discounts, and Pop Art style posters - something different for your walls. If you are concerned about your photos (old and new) deteriorating over time, or maybe just about the amount of storage, then we can simply create a digital archive of your photo collection on disk or memory stick. That's a great way to share your photo collection with family and friends. And don't forget we can scan any old negatives and slides you have to get you great looking photos that the family might not even remember. We also can convert VHS video to DVD. If you want to learn photo restoration and enhancement techniques to work on your own photographs using photoshop, you should check out the guys at Phlearn.com who have a whole bunch of fun, easy to follow tutorials for beginners and for much more advanced users. They are skilled professionals and great teachers.